Ski Line are one of the UK’s largest independent ski holiday specialists, with a proud history of winning industry awards. In the 2017 ‘World Ski Awards’ Ski Line were voted as one of the top 3 ski agents in the world. Yet, Ski Line’s performance in Google was not worthy of such praise. 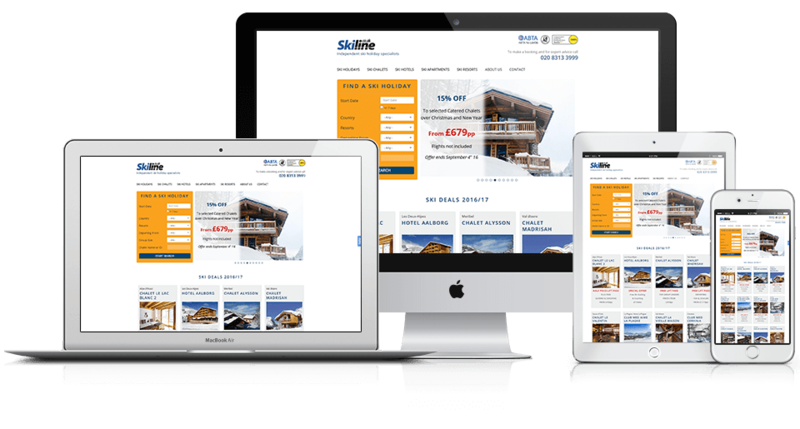 Lagging behind the competition and buried deep on Google’s 3rd, 4th and 5th pages of results - and beyond – Ski Line were not able to take advantage of the huge online demand for their services. We were tasked with rectifying the situation through the development of an organic search campaign. The competition in Google for the travel industry is notoriously high. With huge, established travel agents occupying the very top positions of Google, we had to be inventive with our SEO keyword strategy. After much research and deliberation, to start we decided to target ‘medium tail’ length keywords with high purchasing intent, with fairly high search volumes, and to leave the most difficult and competitive phrases for the time being. Keywords such as ‘Half term ski deals’, ‘ski chalet holidays’, ‘December 2017 ski holidays’ were are first port of call. After selecting our target keywords for the campaign, we developed a detailed technical optimisation report to improve and adjust the Ski Line website’s potential to rank in Google. In additional to SEO elements, we also recommended on Conversion Optimisation best practices to ensure Ski Line were able to take best advantage of the future improved traffic levels. Off-Page SEO is essential to the success of a SEO campaign. Most experts attribute 65% of a SEO campaign's performance to it. Off-Page SEO involves acquiring high-quality "backlinks". In short, the more high-quality backlinks your website has, the higher your website will rank in Google. As part of our on-going SEO work for Ski Line we developed a backlink acquisition program. Each month our team of content marketers produce guest blog posts, editorial pieces, video and other content that will appeal to webmasters, owners of blogs and social media content distributors. We then manually reach out to interested parties to see if our content can provide any value to their visitors or fan-bases. If so, our high quality content gets distributed around the web and great value is provided both to those reading our content and us, as a new backlink has been earned.